Supplier & Manufacturer of PTFE Gaskets. Our product range also comprises of Industrial Gaskets, Shims and Rubber Cork Sheets. 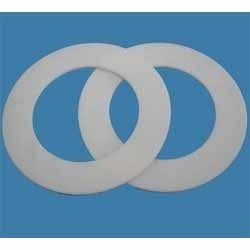 Being a customer focused organization, we are involved in offering a wide assortment of PTFE Gaskets. Our range of these products is available in varied sizes and dimensions as per the clients requirement. A PTFE gasket is made by splitting it from its outside diameter wall to a 1/16 inch from the inside diameter. These gaskets are a unique combination of thermal, chemical, frictional and electrical properties.